GOOO GAMECOCKS!! Sorry, I’m a fan. These yellow cupcakes are topped in tinted buttercream icing to match the school’s colors, garnet and black. They’re topped off with helmets and footballs that are made out of chocolate. To get the garnet color with the chocolate, I mixed red chocolate with a little bit of dark chocolate. The color turned out great! 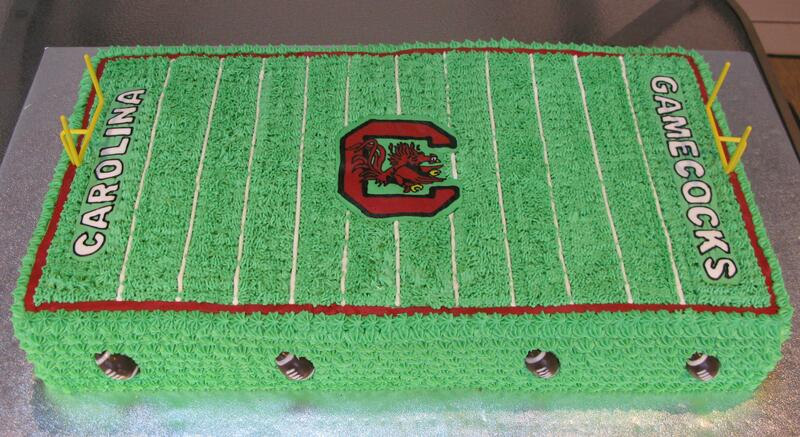 This is a 4 layer 10 inch road cake that I made for the wonderful Gamecocks as well. 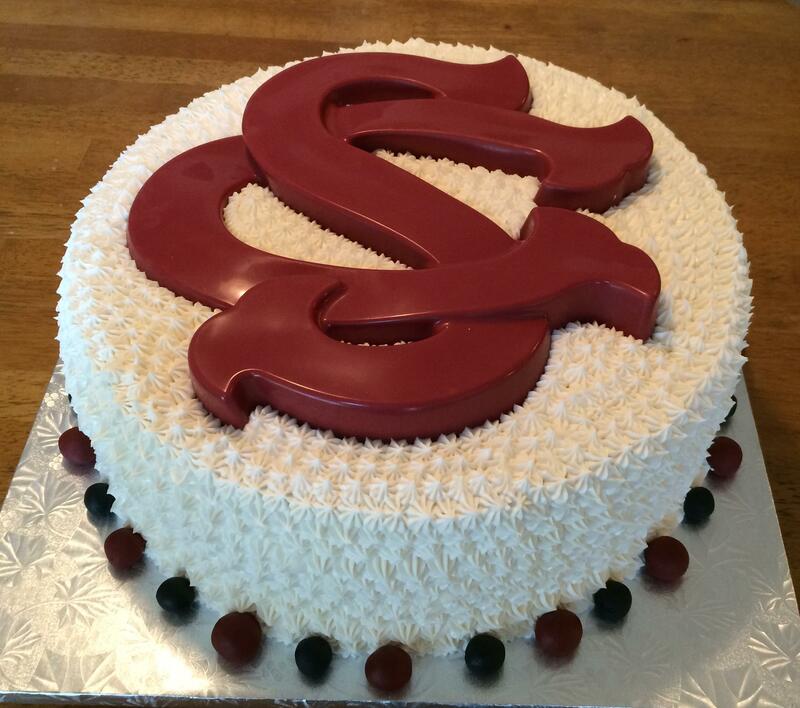 The SC is made out of fondant, then covered with buttercream icing, and the footballs and helmets are made out of chocolate. Gotta love some garnet and black! 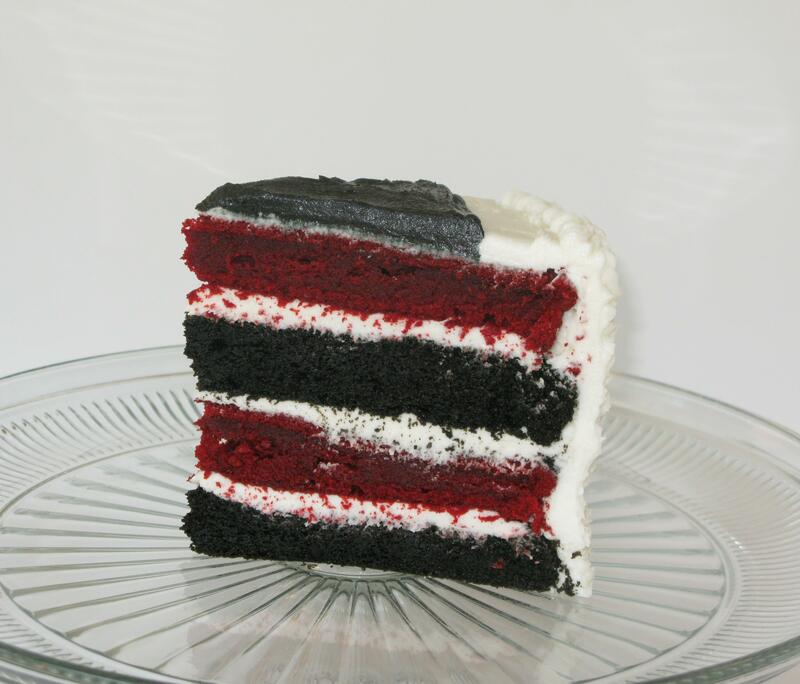 The garnet is red velvet cake, and the black is dark chocolate cake with a small amount of black food coloring. This cake was polished off in no time. 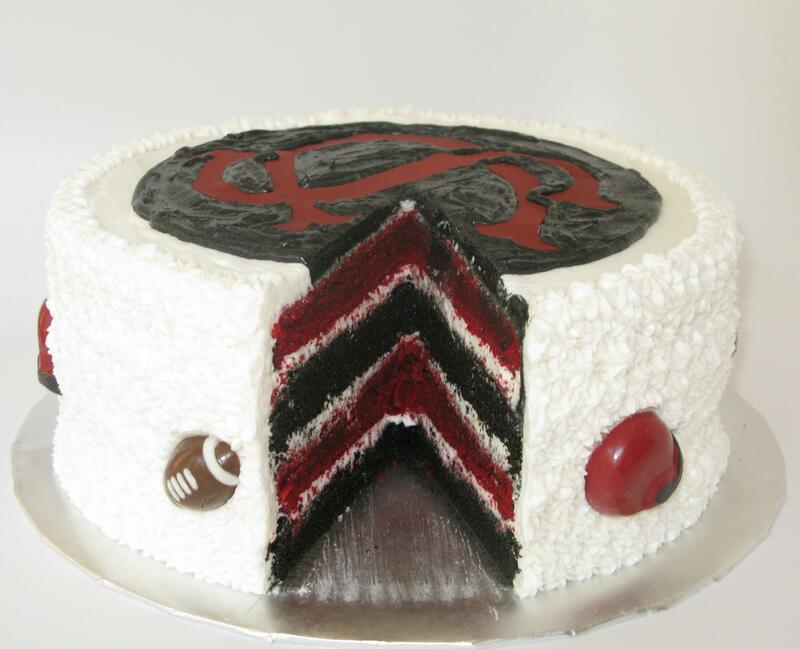 Here’s another 4 layer cake with the garnet and black interior colors. 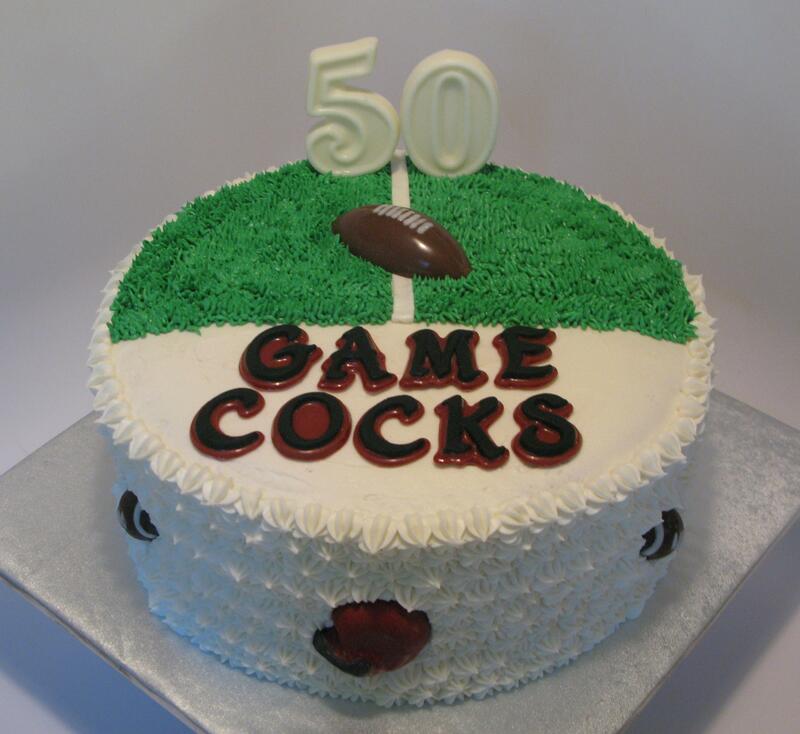 This Gamecock Cake was for a 50th birthday party. The 50 is made out of chocolate, along with the football on top, mini footballs and helmets on the sides. The letters were made using a mold for fondant. 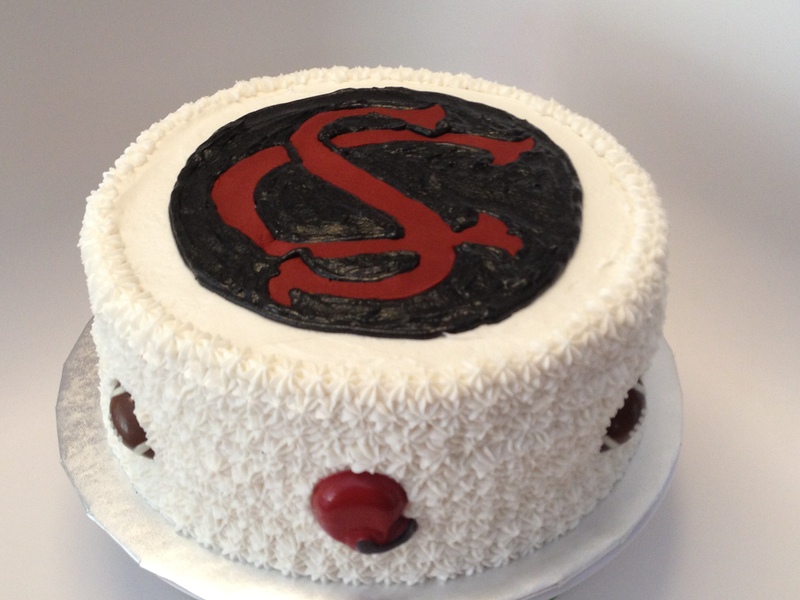 The black part is fondant, and the garnet is chocolate. The green grass is piped on with a grass tip. This was my first time playing with fondant a couple of years ago in a cake decorating class, and it was during baseball season. 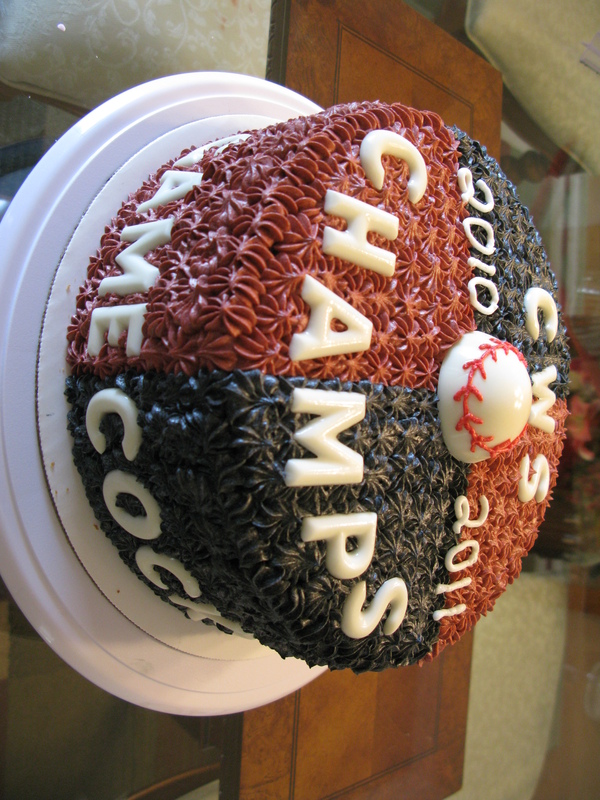 Speaking of baseball…this cake was inspired in 2011 when we won the College World Series for the second year in a row! All of the letters and the baseball are made out of white chocolate. 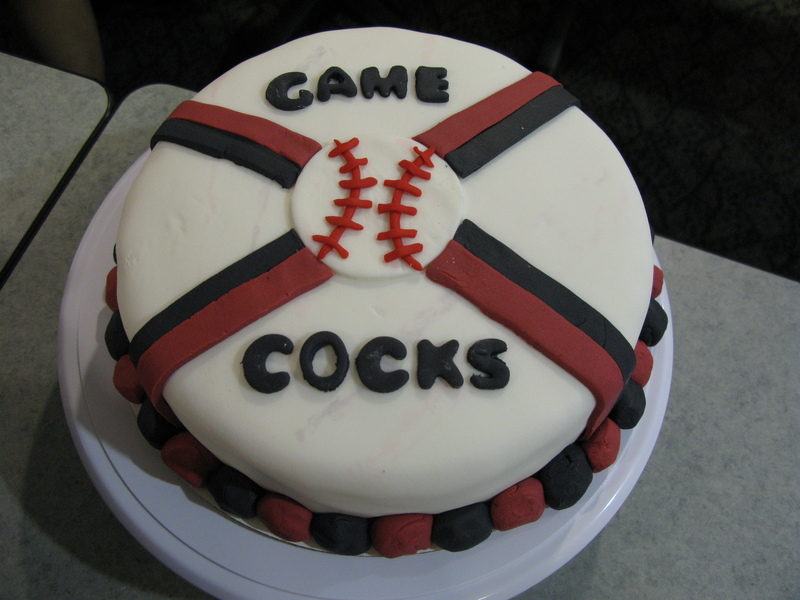 And another Gamecock baseball cake. This 14 inch round cake has 4 layers of dark chocolate (tinted black) and red velvet, giving it that garnet and black color throughout the cake once you cut into it. See picture above for what this will look like on the inside. The topper is made out of solid chocolate that was melted and put into a cake mold, then the icing was piped all over the cake using tip number 21. To finish off the bottom accent colors of garnet and black is different sized balls made out of fondant. I actually didn’t have enough fondant to do stripes on the sides or a different pattern, so I just had to improvise here. This big guy weighed a whopping 20 pounds! It was for a rehearsal dinner for a couple who are big Gamecock fans…and it just so happens that we’re in baseball season. Here, I did a buttercream transfer to get the logo and letters on this Gamecock football field cake. And you know what…this thing was enormous. This 12×24 inch cake is three layers of red velvet with cream cheese icing on the left, and dark chocolate with chocolate icing on the right. The goal posts are simple plastic goal posts that I got in a football cake decorating set. The footballs along the sides are made out of chocolate. The piping along the sides was done with tip number 22, and the grass on the field was piped on with a grass tip. And here’s the close up of the Gamecock logo, done using the frozen buttercream transfer method. I watched this video to get started on learning this method. I’ve made several cakes using this method, and it’s turned out great every time! Your garnet is looking better and better!